Chance or Fate? 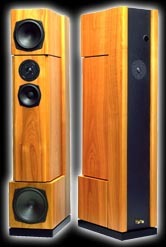 It was quite by accident that The Soul of Music discovered HGP loudspeakers. This happened during the 1999 CES (Consumer Electronics Show) in Las Vegas in January 1999. DIVA designer T S Lim and I were exhibiting DIVA amplifiers at THE SHOW next door to CES. We shared the room with a small American speaker company (nothing to get excited about) and DH Ceramic Cones. It so happened that someone from HGP visited our room to check out the DH Cones. So later, we returned a courtesy visit just to say "Hello". and talked a while with the designer, Horst Gunther Paul - Mr HGP. Later, Lim told me: "Great speaker. The best I've heard in this whole show!" the good sound comes from the speakers, amplifiers, CD player or cables. Lim has 20 years more experience than I, plus he has had hifi "teachers". "What's so good about the speakers." I asked Lim. By this time the show was over. I missed the chance to hear the HGP speakers again. I trust Lim's good judgement and would have imported them on his recommendation. But I did not have the money. earlier bought, through me, a pair of ProAc 3.5 but he was going to sell them to his former boss and buy something better. He was thinking of maybe the ProAc 3.8 or even higher model. Since Werner was going back to Germany for a few weeks, I asked him to check out HGP. The designer, Mr HGP himself, came by last November when we showed HGP at the hifi show at the Meridien. as being either "Reference Class" or "Top Class", alongside other brands that cost much more. Music is proud to be HGP's first dealer in Asia. characteristic sound. When you switch from the most expensive to the cheapest model - a switch from nearly $20,000 to just over $2000 - you will not be disappointed. Back to HGP Speakers . . .